Alexey Gromov and Vladimir Putin. Image: Proekt. How well-coordinated is the pro-Kremlin disinformation campaign? To what degree is the output in Russian media subject to direct control by the authorities? These kinds of questions are important. Hypothetically, one could imagine that propaganda narratives would appear spontaneously, reflecting a fundamental mindset shared by Russia’s leadership and the editors and journalists on RT, Sputnik, and the Russian domestic TV channels. However, a new investigation carried out by independent Russian journalists confirms and adds further details to existing knowledge about a centralized media control system managed from the top of the Kremlin. With references to a number of sources, named as well as anonymous, Proekt then portrays the deputy head of Russia’s presidential administration, Alexey Gromov, and beside him scores of politicians, officials and Kremlin-close “oligarchs,” all linked to each other. It also describes some of the working procedures that ensure the Kremlin’s strategic control over the most influential Russian media. The title of Proekt’s investigation is “Lord of the Dolls: Portrait of Alexey Gromov, the head of Russian state propaganda”. It was published in Russian on 23 January 2019. Image: Proekt. This eyewitness account confirms the analysis which was published by EUvsDisinfo at the time of these events. Proekt’s sources also describe how regions in Russia can from time to time be declared free from receiving any form of negative coverage. The information about these weekly meetings and the so-called “temnik” guidelines that are formulated in oral form, confirms testimonies from whistle-blowers who have earlier emerged e.g. from state TV Rossiya 1 and its sister channel, Rossiya 24. According to Proekt’s sources, top managers from all the large government-controlled outlets and some influential private media attend the weekly meetings. These include e.g. Pervyi Kanal; Rossiya 1 and Rossiya 24; NTV and REN TV. 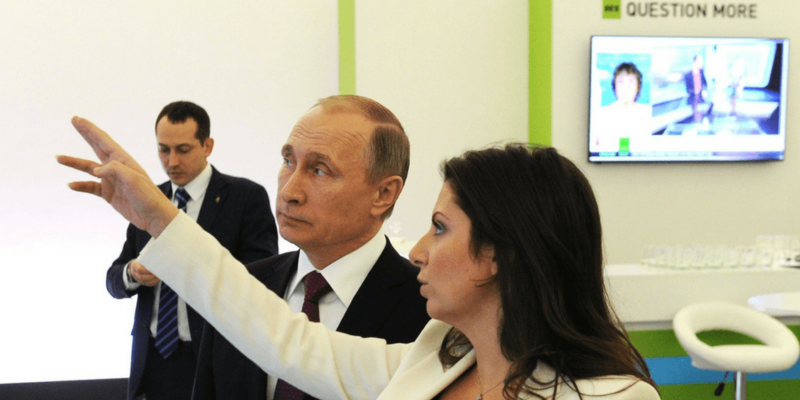 The investigation also describes the special place in the media control network occupied by Margarita Simonyan, the chief editor of RT and Sputnik. Follow the links to see examples of disinformation appearing in these outlets, and which has been recorded in the EUvsDisinfo database of pro-Kremlin disinformation. RT (Russia Today) is like “a defense ministry” and capable of “conducting information war against the whole Western world”, RT editor-in-chief Margarita Simonyan has said. Image: Wikimedia Commons. Proekt underlines that top managers from press services in the presidential administration, the State Duma (Russia’s parliament) and key branches of the government, including the foreign ministry’s spokesperson, participate in the weekly meetings together with media managers and receive similar instructions. Proekt’s publication reinforces the understanding of Russian media control as a complex system in which media managers receive guidelines that “help” them not to overstep the Kremlin’s so-called “double white lines,” combined with much tougher, at times even violent measures allegedly carried out by proxies such as the organisations controlled by “Putin’s cook”, the St. Petersburg-based owner of the infamous troll factory, Yevgeniy Prigozhin. The network around the presidential administration described by Proekt goes further than government and media; it also includes business activities run in partnerships with family members and the oligarchs. This anchors the control over the narratives in the complex reality of business and political power in modern Russian society. Proekt describes how, on the eve of the publication of its investigation, its authors were directly targeted by RT (Russia Today) with claims that its investigative journalism is paid for by money from the U.S.
Proekt’s article inscribes itself in the series of examples when independent Russian journalists have been in the lead in the fight against disinformation and online trolling.